I was found as a stray near Eustis, Florida. I spent a month in doggy jail before I was found and taken in by Schnauzer Love Rescue! I had a great foster mom who really helped me. Then the Tuesday before Thanksgiving 2007 my new parents gave me a forever home! I am so happy with them. Then on Thanksgiving day I met my mommy and daddy's four grandchildren. WOW! I have a family. I have sooo much to be thankful for! love this story but who in hell could have abandoned such a beautiful and loving dog. My boyfriend would take bullets for our mutt! Actually in tough times like these days he'd starve to feed the dog! 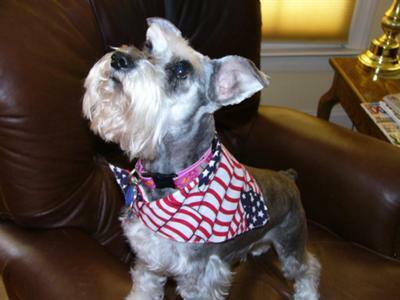 Bella, you are such a beautiful Schnauzer!! You are so lucky to have found a lovely new home. We know that Schnauzer Love Rescue do some great work rescuing Schnauzers and placing them with loving families - looks like you are living proof of that.